For me eating raw vegtables and leaves seemed weird before. This is because I am born and brought up in India where the people cook the food with all those delicious spices and eat. I love my food cooked and flavored, but now after tasting many different kinds of salads which are healthy too, I find myself enjoying these kind of foods either. 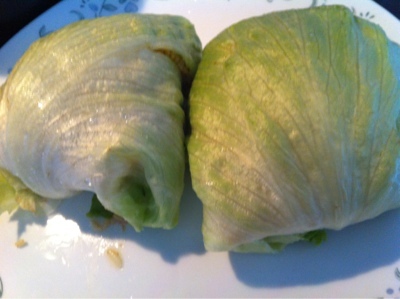 Especially, Iceburg Lettuce it is wonderful leafy vegetable that you can enjoy every bite of it with any combination you wish, some people like eating it with salads and some like me love eating with fried rice. Now coming to the recipe. Heat oil in a pan and add bay leaf, beans, celery, onions and green chili. Saute until the raw flavor goes away. Then add coriander powder, soy sauce, salt and pepper powder. Give a quick saute until the all vegetables are well cooked under medium flame. Now add rice, mint leaves and cilantro and mix well. Cook for about 2min under medium flame and squeeze some lemon juice at the end. 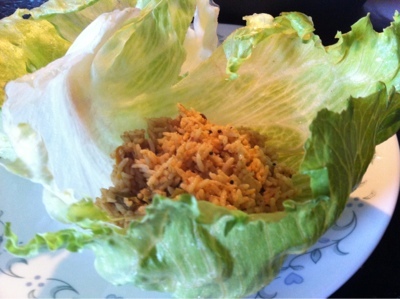 Let it cool down a little bit because the lettuce leaf is very tender it may loose its crispness when you add hot rice to it. To seperate leaves from lettuce, hit the stem portion to the cutting board twice then it will become loose and you can pull out the stem easily. Now you are left with leaves and you can easily seperate them. 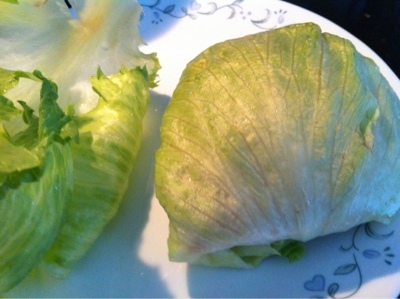 Take water in a bowl and add 1/2tbsp of salt and wash the lettuce leaves in it, keep it aside and let it dry. 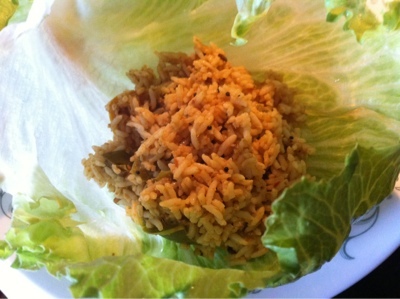 When the leaves are dry, put some rice in the leaf and fold it, place the folded portion down and serve with your favorite sauce on top. You can enjoy the same with egg fried rice, chicken fried rice etc., it tastes wonderful!!! I am still in the same boat as you, eating raw veggies is not very tempting, but I like the filling inside, so that makes it better. Variation is always nice..you get to enjoy different kinds of food. 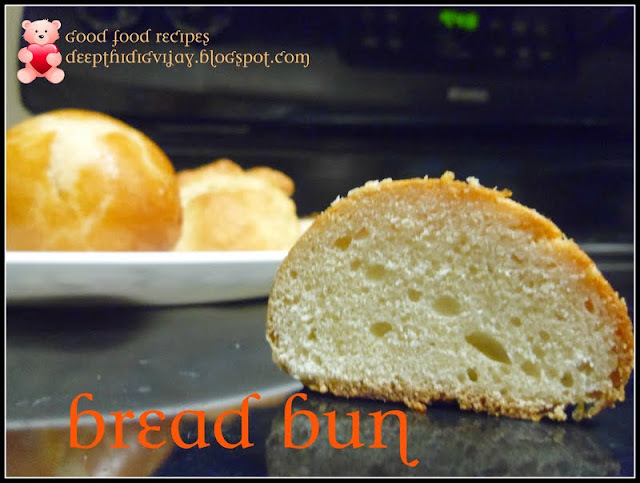 Prefect for a quick and filling dinner..
Great and super rolls !!. Very healthy and yummy idea, have seen people eating this, yet to try.. This is indeed a nice wrapped roll.. If the lettuce is fresh, it is a delight to eat raw. I guess the climate here sometimes can affect the freshness of the salad greens. Thank you all for your wonderful comments!!!! Why didn't I think of these before! Rice rolls... nice concept mate... Can I share it my blog at http://foodsuncovered.wordpress.com/ Thanks!